The news, as it is wont to do these days, came via Twitter first, and then I found it in the mail. A poster. 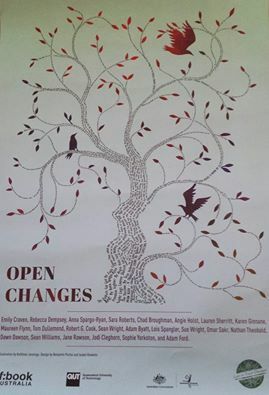 One of my stories for If: Books Open Changes was used for a Story Tree poster and it arrived the other day. It’s the first time some of my writing has been published as a poster. My story, City Lines (or part of it), is along one of the branches. You can read it here in full, if you like, along with the others. It’s got me thinking about how this project, to write specifically in response to other writing, is just a more deliberate exercise in story telling. The tree, with its natural curved lines that split and cross each other and meander around, is more like writing without the conscious decision to take inspiration from, or copy or plagiarise (for that matter). Writing (or anything that offers something to the soupy conglomeration we call culture), both takes from and adds to its sources. It is a leaf on a tree that is ancient and twisted and continually growing, yet, it is also possible for it to become a seed for others so later creative endeavours might generate from it. Writing at it’s best is organic, or as close as to organic as critical thinking types can get. The analysis should come after (if at all). I might be still under the influence of A Thousand Plateaus, but culture as tree, or writing as a tree has something to it. No matter how tiny a leaf you or I might be as writers (or artists or musicians etc), we are all part of the tree. It’s some comfort to know I can make a contribution, that somehow the tree is vast enough that we can all fit and find a place, and recognise the branches from which we grew and were nourished, artistically speaking. Even before my poster arrived I was thinking along these lines, partly because I was thinking about my recent forays into Zentangle drawing and photography (just via Instagram) and nature and how organic shapes juxtaposed to architecture ones sing, with the right effort. Yet is was also partly because, for all the sadness in a recent article by actor Samuel Johnson, there is beauty and power too. I urge you to read it. I won’t spoil it, except to say one of his points wasn’t lost on me: some things last and other things do not. The things that are not lost, often happen to be part of the tree. If I hope to have any kind of legacy it is by clinging to this tree. I’m not arguing for my lasting fame as a writer, because despite the value humans have tended to put on past art, what becomes of it in the future is down to luck. I feel sorry for that harried 51st century researcher investigating the archaeology of late 20th century email correspondence through surviving floppy discs, for instance. Then I grab that pen, or go to my keyboard, for there is much to do before I fall off the twig (in a long, long time hence). 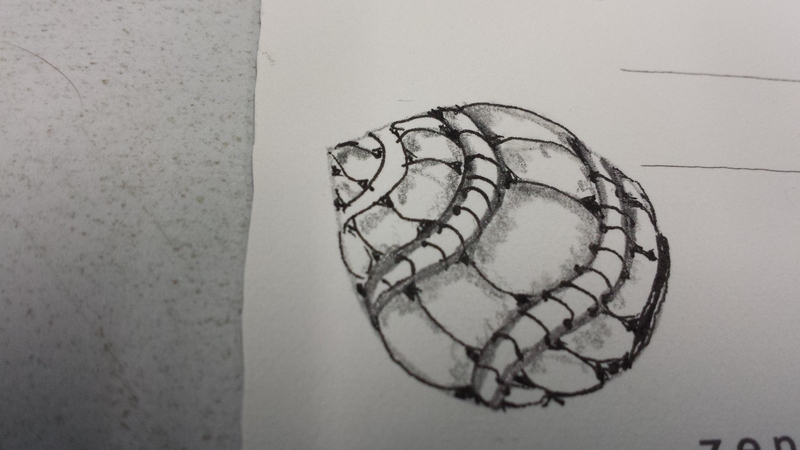 Rough Draft: Zentangle seed from the Tree.